This thrilling 2018 Great Britain 1 oz Silver Britannia Coin is the newest release in the famous Silver Britannia series - the official silver bullion coin program guaranteed by the British Government. This classic coin series was introduced by the Royal British Mint in 1997 and since then, features the stunning image of the beautiful Britannia - the female exemplification of Great Britain. Britannia is showcased in her classic toga while wearing a war helmet and holding a trident in her right hand and a shield in her left hand - the symbol of the Nation’s protection and peace. 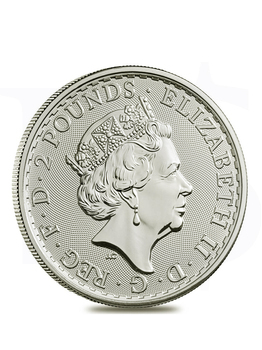 The obverse features the beautiful profile portrait of Her Majesty wearing her trademark diadem. The coin’s exceptional design and popularity make it an excellent gift and an iconic addition to any coin collection. Individual coins come in capsule. 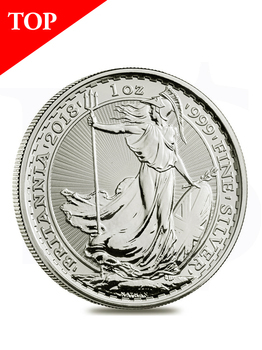 The first Britannia to feature The Royal Mint's new guilloché obverse design. Reverse: Features the internationally recognized figure of Britannia standing firm against a powerful gale. Her image has symbolized Britain’s strength and integrity on coinage since Roman times. A radial sunburst design behind Britannia adds anti-counterfeiting protection Sovereign coin backed by the British government.